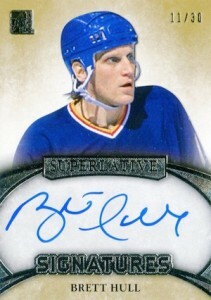 2015-16 In the Game Superlative Hockey returns under the Leaf name and features a high-end look at hockey collecting. Each limited box includes seven total hits. One of the key elements of the 2015-16 Leaf ITG Superlative Hockey product and likely to result in continued interest for Leaf Hockey products, the first autographs for rookie Jack Eichel are found in the premium release. The second overall pick behind Connor McDavid, Eichel is also thought of as a legit star option among 2015 rookies and Leaf has the exclusive for his signed cards. Although the exact print run is not known, it is mentioned that this will be one of his rarest cards of the entire year. 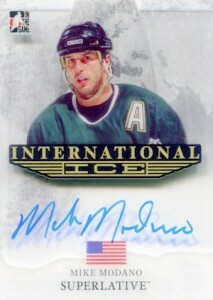 Focusing on hard-signed cards, acetate International Ice Signatures are joined by Immortals Signatures, Superlative Signatures and Superlative Signature Memorabilia. 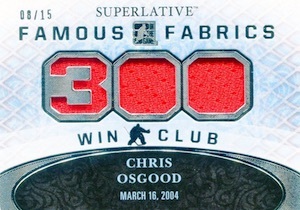 Memorabilia cards include Blade Runners, featuring game-used skates, Famous Fabrics Four, Superlative Emblems and The Superlative Six. Zeroing on milestones, 1,000-Point Club and 300-Win Club relics are also found. Parallels as limited as one-of-one extend to each of the relic and autographs inserts. Presenting more security for collectors, all cards in Leaf ITG Superlative come in magnetic cases. Only 200 total cases are available for the limited product. 15-16 Itg Superlative International Ice Blue Auto Mario Lemieux, 6 10! 31 cards. Serial numbered #/15 or less. 11 cards. Serial numbered #/20 or less. 5 cards. Serial numbered #/7 or less. 18 cards. Serial numbered #/15 or less. 27 cards. Serial numbered #/30 or less. 20 cards. Serial numbered #/6 or less. 16 cards. Serial numbered #/25 or less. 19 cards. Serial numbered #/18 or less. 19 cards. Serial numbered #/30 or less. 19 cards. Serial numbered #/20 or less. 8 cards. Serial numbered #/8 or less. Beautiful high quality cards. Must see in person. I have opened 3 boxes and have exceeded value in each. Going back for the last two from the case. Impressive Set. After reading the checklist and looking at EB, I was so impressed that I just bought my first Superlative Signature and then bookmarked them all. That equals a 5 in my book I find these to be a good alternative to massively produced sets from the company that bought the license. Granted, this set is more about creating collectibles than printing cards, which both have merits. The players list represents all the greats of hockey history, including an ode to Soviet players, like Kharlamov, Krutov & Tretiak, to name only a few, which is unique. I spotted the Soviet flag on one, with the word Russia beneath, which is technically not correct. 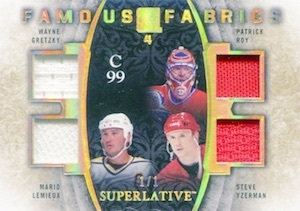 Fedorov & Bure, as well, but no Ovi – I can live without him for one set. Another oddity, the Sweden Peter Forsberg card has a picture of him in an Avalanche uniform (sans logo, bien sur) – did you not search the web for a photo of him from Team Sweden? But, oddity can make something collectable, too. I think it was a good idea to feature countries flags on some cards, in place of logos, but overall, the set does not suffer from the lack of team identity badge – the individual accomplishments of each player are brought to the forefront, especially in the 1000 point / 300 win sets. The sets are not paralleled to death, either. As a high-end product, they start serialized in the low low numbers and work their way down even lower to 1/1. If you want to own a piece of skate, yes I said skate, from the Blade Runners subset, you have only 63 chances. Originality and scarcity, need I say more. In these very limited numbers, I find the set to be a worthy investment, as well as a great collectible. I hope to see these cards values trending up in the future. Note that there are very few active players in the set, which is ok, and they are mostly in the 1/1 NHL Shields set: Joe Thornton, Tkachuk, Eichel, Hossa, Gaborik, and Scott Gomez. In some other sets: M.A. Fleury, Jagr, Tkachuk, Eichel, Drouin. I may have missed a few. But, as I said, all the greats of years past (+Jagr!) are among these original & gorgeous cards. Just want to make it clear that I’m a collector and not an employee or broker, if JG was referring to my post. My purchase was my 3rd Leaf card only and I have no bias, either way. The card I bought was under $10, so I considered it a find and kind and thought owning a /15 Lemieux or Yzerman auto would be awesome if I could afford it. The only value I care about is long term value (will my initial investment stand the test of time?). Seems to me anything under /25 is selling for a high value, although when I do the math, 430/7=63/card, it does seem they sell at a premium (obviously, in favor of the buyer). Since high prices benefit long-term collectors (with a lot of money) and sellers, I dare to say that sellers shoot themselves in the foot, by undercutting each other, but then there’s the old supply vs. demand, eh.